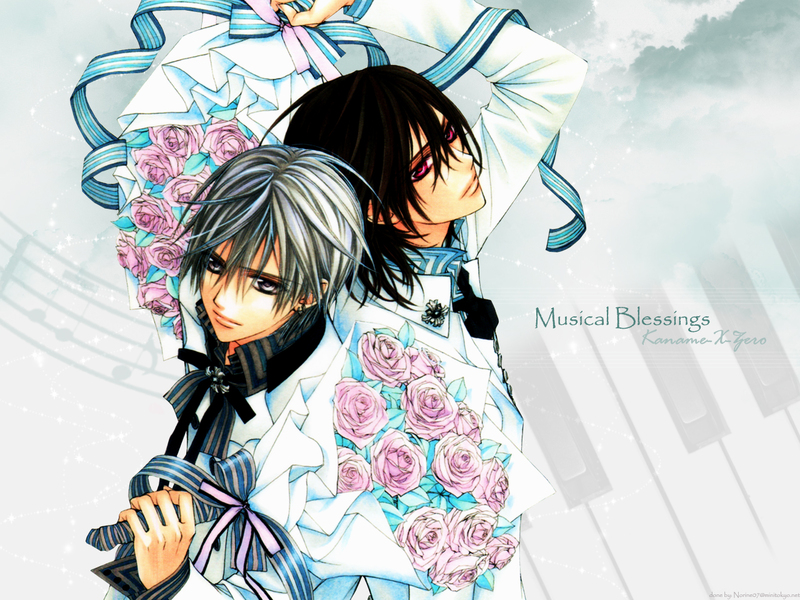 Vampire Knight Wallpaper: Musical Blessings. Minitokyo »	Vampire Knight Wallpapers » Vampire Knight Wallpaper: Musical Blessings. Thanks everyone for the faves! If not my wallpaper would not be on popular art! Hey Guys it's been awhile since i even made anything at all. This here is a simple wallpaper on vampire knight featuring Kaname and Zero. well cause i didn't want to screw things up making it messy and everything. Basically this wallpaper is influenced by music. which well i'm not up to standard yet, so i'll practice a little more. and this is the final arrangement/concept, yup! i changed it to the colors instead.the sky because of the phrase "blessing from heaven" so yup. and of cause musical notes,piano keys, to include music into the wallpaper. Finished with some sparkle to end of the whole wallpaper. remember to full view! ^-^ nya~ will be doing some more wallpapers in future i hope. if i'm not lazy that is haha. of course one for the Christmas too! till next time! brushes used credited to all rightful owners. Nice to see Zero holding something other than Bloody Rose. The two are so cute together :) i love this wallpaper! Oh lovely! The colors are wonderful and let's not forget Zero and Kaname! They both look very handsome! great pic! shows another out-of-the-ordinary side of vampire knight! great pic! it's nice to see another out-of-the-ordinary side of vampire knight! peaceful atmosphere in the wallpaper. I really love it, great job. I love Vampire Knight ! Oh, this is beautiful! I like how the background blends in with all the colors. They all make up! So pretty! Thank you for sharing! Great job! Great anime and nice wallpaper,thanks for sharing. This wallpaper is really lovely. This wall reminds me Arashi's song One Love which is the theme song for Hana Yori Dango movie.